According to the 21st edition of its report Satellites to be Built & Launched over the Next 10 Years, Euroconsult anticipates that 330 satellites with a mass over 50 kg will be launched on average each year by 2027 for government agencies and commercial organizations worldwide. This is a threefold increase over the past decade as the satellite market experiences a paradigm shift with the rise of small satellites and large constellations. 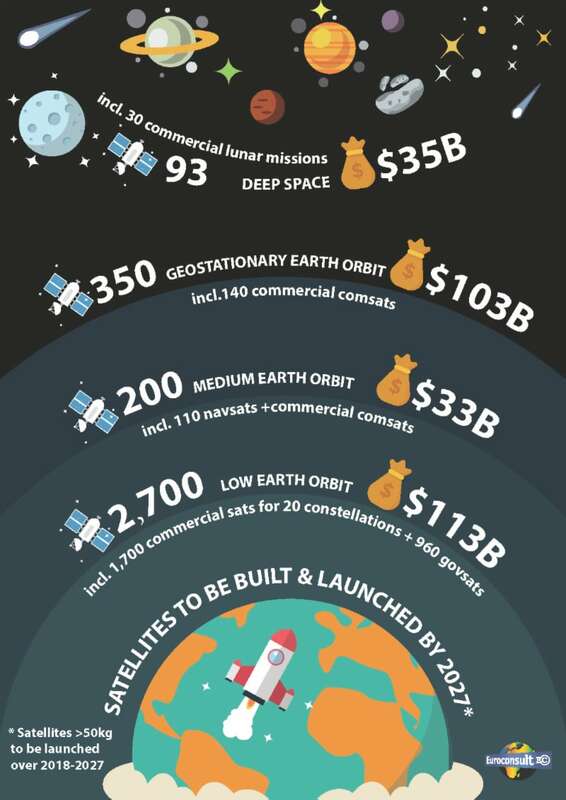 The 3,300 satellites over 50 kg to be launched over 2018-2027 should represent a market of $284 billion for the space industry in terms of building and launching, up 25% over that of the past decade. At the same time, a price decrease is visible in the satellite industry, driven by the commercial constellations of smallsats introducing new production and operation concepts including economies of scale, softwarization, and vertical integration up to data analytics. Euroconsult is the leading global consulting firm specialized in high technology industries, with expertise in the space industry, satellite-based applications and aero connectivity. As a privately-owned, fully independent firm, we provide first-class strategic consulting, develop comprehensive research and organize executive-level annual summits and training programs for the industry. With more than 30 years of experience, Euroconsult is trusted by over 600 clients in more than 50 countries. Euroconsult is headquartered in Paris, France, and has offices in Washington D.C. and Montreal, as well as representatives in Singapore and Tokyo.